The international neutrino experiment, ProtoDUNE, which is co-led by Liverpool Physicist Professor Christos Touramanis, has for the first time ever recorded the signal as a cosmic particle travelled nearly 4 meters through liquid argon. ProtoDUNE, the newest detector to become operational at CERN, aims to unlock the mysteries of neutrinos and this milestone could help explain more about how the universe works and why matter exists at all. Based on the Swiss/French border, the enormous ProtoDUNE detector is the largest liquid-argon neutrino detector in the world. The size of a three-story house and the shape of a gigantic cube it has just recorded its first particle tracks signaling the start of a new chapter in the story of the international Deep Underground Neutrino Experiment (DUNE). This takes the DUNE project a step further on its scientific mission to unlock the mysteries of neutrinos, the most abundant (and most mysterious) matter particles in the universe. DUNE will not only study neutrinos, but their antimatter counterparts as well. Scientists will look for differences in behavior between neutrinos and antineutrinos, which could give us clues as to why the visible universe is dominated by matter. The UK is investing £65million in this flagship global science project based in the United States that could change our understanding of the universe. The investment, made under a 2017 UK-US Science and Technology agreement, has enabled many UK groups to work on ProtoDUNE that is the prototype for the forthcoming USA based DUNE project. 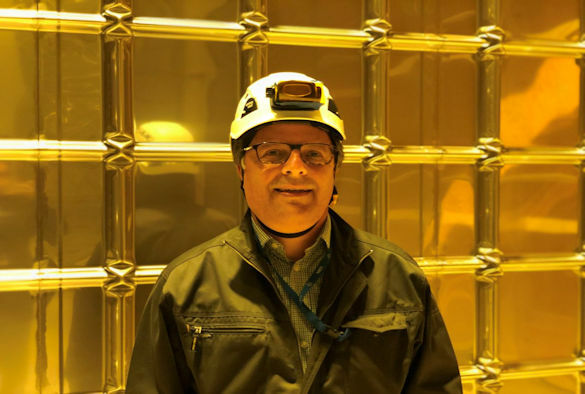 ProtoDUNE co-leader Professor Christos Touramanis, from the University's Department of Physics department, was resident at CERN for more than a year providing daily leadership on all aspects of the project and saw first hand the UK involvement in this project. “The UK neutrino community has made crucial contributions in the construction, integration and installation, and now commissioning and operation of ProtoDUNE. In addition the data acquisition team was jointly led by a UK and CERN physicist and many UK scientists working at CERN have been key in enabling the recording of these particle tracks so early in the commissioning stage”. The ProtoDUNE detector is the first of two prototypes for what will be a much, much larger detector for the DUNE project, hosted by the U.S. Department of Energy’s Fermi National Accelerator Laboratory in the United States. When the first DUNE detector modules record data in 2026, they will each be 20 times larger than these prototypes. A UK team completed the first prototype Anode Plane Assembly (APA), the largest component of the DUNE detector, to be used in the protoDUNE detector at CERN. The APA, which was built at STFC’s Daresbury Laboratory, is the first such anode plane to ever have been built in the UK. 150 APAs are being produced by the UK for the large-scale DUNE detector and are being paid for as part of the £65million investment by the UK in the UK-US Science and Technology agreement, which was announced in September last year. UK involvement with the DUNE collaboration is through STFC and the following universities: Birmingham, Bristol, Cambridge, Durham, Edinburgh, Imperial, Lancaster, Liverpool, UCL, Manchester, Oxford, Sheffield, Sussex and Warwick. STFC manages the UK’s investment in the international facility, giving UK scientists and engineers the chance to take a leading role in the management and development of the DUNE far detector and the LBNF beam line. The STFC Technology Department is also involved in the data acquisition system for the detector and in designing a high power neutrino production target. The technology of the first ProtoDUNE detector is the same as that to be used for the first of the DUNE detector modules in the United States, which will be built a mile underground at the Sanford Underground Research Facility in South Dakota. More than 1,000 scientists and engineers from 32 countries spanning five continents – Africa, Asia, Europe, North America and South America – are working on the development, design and construction of the DUNE detectors.